Some years ago I played a game that tried too hard to be Grand Theft Auto. Saints Row was overwrought, it's humor fell flat, and the game had so many bugs, it got it's own musical. The game was loaded with direct copies of GTA mechanics, the graphics were seemingly unfinished; in short, I didn't like it. 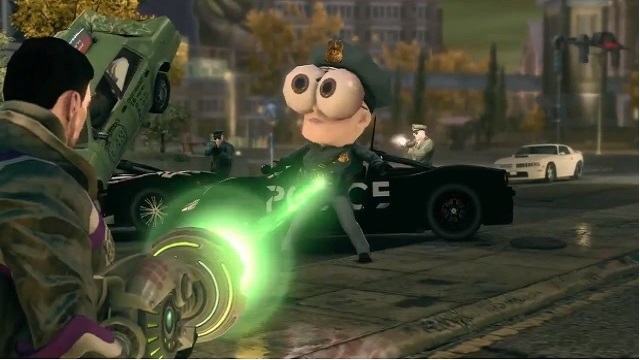 When Saints Row 2 was announced, I rolled my eyes at the septic truck ad and the utterly over the top direction the game took. Being an overly pretentious gamer, I wrote the series off, determined that it just didn't have "enough depth." I railed against the game, said that they missed the boat and could never match the tongue in cheek humor of GTA. Last week, I downloaded Saint's Row: The Third from PlayStation Plus. After all, it was free. I figured I had nothing to lose. Within the first half an hour, I realized how wrong I had been about the series. Saint's Row may have started as a GTA clone, but the series became something so much more than that. The "trying too hard" humor that many critics (myself included) lambasted was taken into the realm of ridiculous. I've heard Saint's Row described as "Gonzo." I think the term, in keeping with it's roots in the work of Hunter S. Thompson is perfectly accurate in describing Saint's Row. The Saint's Row series took the tropes and traditional schemes omnipresent in video games and threw them out. Those tropes that weren't outright tossed were blown into such preposterous proportion to make them obvious targets to poke fun at. Most games I've played that laid claim to an open world still forced me into a single character, or gave me variations on the white washed theme to choose from. Even options meant to convey heavier characters are really nothing more than swollen versions of the lean, muscular models. Saint's Row allowed me to make an obese, green skinned woman with iridescent purple hair. Even without robust character creation, Saints Row has brought player freedom new meaning. I spent fifteen minutes intentionally crashing cars into a large concrete barrier to propel my character through the windshield and off a cliff, just so I could pull my parachute and glide through the city. Perhaps I wasn't ready for Saints Row before now. When I first played Saint's Row, I was assured that games should do nothing short of stun and amaze me with their depth and meaning. Over the years I've come to realize that, much like any art form, there is a game for every mood and context. 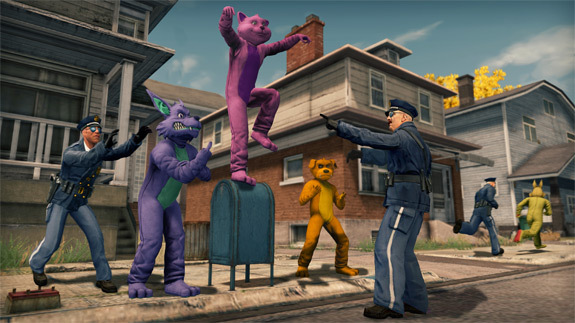 Saint's Row is to video games what Gamma World is to tabletop games; an entertaining and over the top escape. Having just finished The Last of Us, I found Saint's Row to be a perfect antidote to the parade of seriousness and sorrow my current playlist had brought round. I'm now an unabashed fan of Saints Row and look forward to the upcoming fourth game in the series. In the meantime, I have mind controlling octopi to shoot at gangsters.